The family vacation planner template is an excellent tool for planning and organizing your next family vacation. 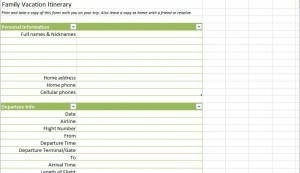 The family vacation planner template is free and very easy to use. The family vacation itinerary template includes categories that will help your trip to be a stress free vacation. No more fumbling through bags to look for important information such as addresses for lodgings, reservation information and car rental details. All of your trip details will be on one handy document. Plus you can make copies for other family members to carry. In addition, the template is customizable in excel. You can tailor the family vacation planner template exactly the way you want it organized. Use the itinerary section of the template to plan your trip. Add dates, locations, addresses and phone numbers. Have important information at your fingertips. In the transportation section, you can add flight details, rental car details etc. Make notes regarding flight departures and how many hours ahead of the flight departure you should arrive. Packing details. A packing list is so important for a stress free vacation. Forgotten items such as glasses or medications can ruin a trip. Print the planner and have it with you as you pack. Check off each item as you pack the bag. You could customize the list for your carry on bag and another list for your larger suitcase that you check in. How often have suitcases gone missing at airports? If you are flying always pack your carry on with at least an extra set of clothes and important items, such as medications and of course a copy of your family vacation planner template! How many families travel without a list of emergency contacts? An emergency is never something we want to think about , but it makes sense for each family member to have a copy of this list with them. If you became ill and were hospitalized, your children would have the list with grandma’s phone number right there in their backpack or suitcase. An excellent detail on the template is the section for the traveler’s blood type. In an emergency situation, this can be life saving information. The family vacation itinerary template is the perfect tool to use for your next family vacation. Download it today and take the potential stress out of your next vacation. Have your family members join in and help you customize the fields for your next trip. Planning a trip together can be fun and exciting when everyone joins in.